Qualcomm has released the software development kit for its Toq smartwatch, which could be just the shot in the arm the limited product needs. The Toq's colorful Mirasol e-ink display, which is easily visible in sunlight, gives the smartwatch a real advantage over competitors. But without more compelling functionality, it struggles to justify its relatively expensive price point. Hopefully there's enough interest in the product for developers to flock to the SDK. Curious developers can just head over to Qualcomm's page and download the SDK from there. The kit offers the ability to install, update, and uninstall applets on the device. It also supports sending notifications, which is still arguably the most useful aspect of any smartwatch. 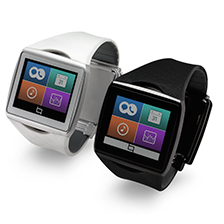 The Pebble has benefited greatly from all the cool things developers have enabled it to do, and we can only imagine what might eventually pop up on the Toq's much more capable screen.